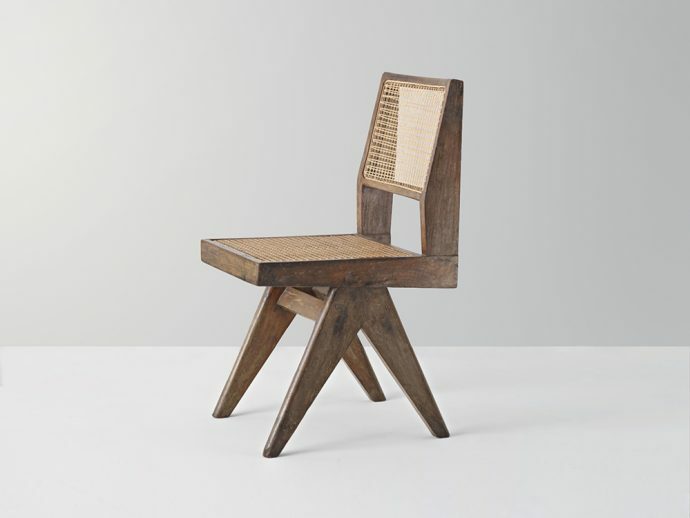 Chair in solid teak and braided canework with asymmetrical "compass" type double side leg, ca. 1958. Student chair getting sold by us. We have objects from Chandigarh offering from the University. Best and biggest selection of best seats.They created a vision for India, designing also from chair, lamp, desk and easy chairs to a complete unity together with the city. furniture on the best way. Done in teak and cane. This quality product of antique history is sold like art. Buy art and we finally sell that piece for you. Offering chairs, furniture, easy chairs, sofa, office cane chairs and all other pieces from Pierre Jeanneret. Design is important PJ-SI-25-A and all that tables and Charlotte Perriand tabouret and stools make auction nice. We sell even office desk. We sell kangooroo jeanneret chaises. File racks and also Committee chairs. Especially the easy chair is a good piece to have. The topic with Le Corbusier and Charlotte Perriand made design in India important. We sell original vintage furniture. Sitting is all over here in New York and so in Los Angeles too. Buy it in London, offering my best designers all over the World. Galerie P! is a great seller. Interior design respect that duty also. My personal addiction for design and fashion is obviously. Library chair is a wonderful furniture chair. The seat of the library chair also. So enjoy design.